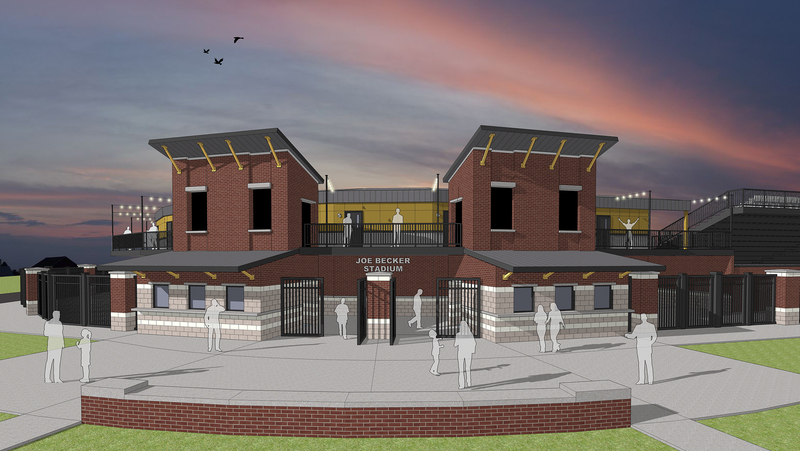 "Joe Becker Stadium is getting a new look. Crews from the Joplin Parks and Recreation Department have removed the press box and are remodeling the concession stand in an effort to update the facility, said Chris Cotton, parks and recreation director. The new press box will include a dressing room for umpires, who previously changed clothes in a city-owned house across the street from the stadium, Cotton said. Volunteers from Americorps have occupied the house on High Street during their efforts to help the city recover from a tornado that struck on May 22, 2011. “It will be a little bigger,” Cotton said of the structure that will be on top of the concession stand. “We will be adding central air and heat.” The chain-link fence behind home plate also is being replaced, he said. Craig Hull, director of the Joplin Sports Authority, welcomed the remodeling. Joe Becker Stadium was the home of the Joplin Miners minor-league baseball teams in the 1930s, ’40s and ’50s. Among the all-time greats who played there were Mickey Mantle, Stan Musial, Joe Garagiola and Ken Boyer. The stadium in recent years has served area college, high school, American Legion and other youth teams along with regional and national tournaments, such as the Premier Baseball Junior Championship, which Hull said will return to Joplin next summer. The stadium is the home of the Missouri Southern Lions, who are scheduled to play Nebraska-Kearney in a three-game series on Feb. 23-24 at the stadium. Joe Becker was a professional umpire and scout who was business manager of the Joplin Miners from 1936-42, according to the Lions’ media guide."